When exhibitions are on display we are open the following hours; the gallery is closed between shows when installation is taking place. If you would like to stay informed about upcoming arts events on campus, and would like to be added to the Arts and Communication e-mail list, go to email sign-up. First floor of the Greenhill Center of the Arts, 950 West Main Street on the campus of the University of Wisconsin-Whitewater. 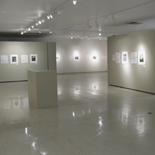 The Crossman Gallery is open to the public and is free of charge. The Center of the Arts is accessible for those with special needs. Group tours of exhibits may be arranged by calling the gallery office; please make your tour plans well in advance.